Have you been dreaming of designing your dream kitchen and you’re finally about to realize your dream by bringing your remodel to life? Planning a kitchen remodel can be exciting, especially if you’ve been living with the same, dated kitchen for several years. 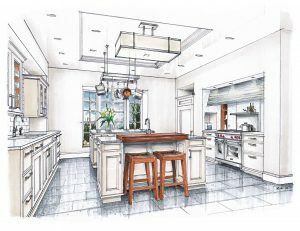 Before you get started with your kitchen remodel, however, here are some helpful ideas to help you design the kitchen of your dreams. Your next step should be to assess the space you have to work with to determine your kitchen’s layout. Now is the time to change things up if you don’t like the way your kitchen is set up. Map out where you want cupboards, countertops, islands, and appliances to go. This can make it much easier for you when you go to buy the materials you need for your project. Now that you have a theme and have mapped out your space, your next step should be to purchase the materials you need for your project. Before you buy your materials, you should decide what type of materials you want. Do you want marble or linoleum countertops? Composite or hardwood cabinetry? These will play a part in the overall cost and should be considered. With these guidelines, your kitchen project can run smoothly and you’ll have a nice finished product.